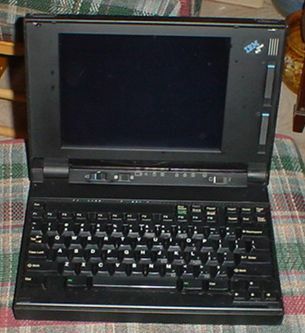 The PS/2 Note N51SX is another portable PS/2 model. Other portable models in the PS/2 lineup include true laptops, like the L40SX and luggables, like the P70 and P75. This system was offered with two different processor types. You could get the 386SX or IBM's own 386SLC, which was a 486SX compatible core packaged in a 386SX-compatible casing. My N51SX has seen some better days, unfortunately. The exterior has scratches and gouges in the rubbery casing material. While the interior is in very good condition, the display panel doesn't seem to work at all. The hinge holding the display is very loose. It will stay open, but one has to balance the panel very carefully or it will fall backwards. I have powered this up once to find that it will boot. What it is booting into is another matter entirely. I suppose that I could try to "blind type" through the reference diskette and activate an external display to what kind of shape this thing is in otherwise. Perhaps I will take it apart and see if the display problem might be easily resolved. Louis Ohland has a page on the 8551 N51SX/SLC variants here. Because the Thinkpad 700 is closely related to this system and because this page is simply too good not to include a link to, here's the start of a page written by Tim Knight and adapted to HTML by the infamous bobwattsTM of Whizzbang Computers. Perhaps someday we will know the rest of the story.